Jonathon Coombes recently blogged in MySQL Cluster Certified that he passed the MySQL Cluster DBA Certification as was the first Australian. Lucky for him I passed the exam after my presentation on the second day of the conference. I guess us Australian’s are leading the world! As Jonathon said it was rather hard, certainly more difficult then the other DBA exams but nothing for an experienced Cluster DBA. MySQL Conference 2007 Day 4 rolled quickly into the second keynote Scaling MySQL at YouTube by Paul Tuckfield. This talk had a number of great performance points, with various caching situations. Very interesting. Caching outside the database is huge. It a display of numbers of hits per day it was said “I can neither confirm or deny the interpretation will work here (using an Alexa graph)”. This is not the first time I’ve heard this standard “Google” response. They must get lessons by lawyers in what you can say. You don’t worry about it when a replicas fail. How many backups can you restore. When you switch you a replica, are you sure it’s right? Did you test recovery, did you test your backups. Keep “intentional lag”/Stemcell replicas – Stop SQL thread, keeps a server a few hours or a day behind. Say if you drop a table you have a online backup. When upgrading, always mysqldump then reload, rather then upgrade database. Don’t care about CPU’s. I want as much memory as possible, I want as many spindles as possible. For YouTube 2-3 second lag is acceptable. Hit in db cache means lower caches went unused. Miss in db cache can only miss in other caches since they’re smaller. Caching reads is worse then useless. It’s serialized writes. An important lesson learned. Do no cache reads in F/S and Raid Controller. Writes are parallel to master, but serialized to replicas. We need true horizontal partitioning. Replication lags: one IO bound thread. You do know the future, commands are coming up serially. Write a script to do reads, before updates coming up (because they are cache hits). The diamond. For golive, play shards binlogs back to original master for fallback. In a community session yesterday at MySQL Conference 2007, I first heard about Dorsal Source. A collaboration between Solid DB and Proven Scaling that allows for community people to upload patches to MySQL, get it compiled across multiple platforms, and have a downloadable distribution available on H/W individual contributors will never have access to. That’s a great idea. I also hope we get the opportunity to get compiling of patches into multiple versions, as well to get builds of a lot of patches together. Personally, I’m running 3 versions just to diagnose one problem. 5.0.36 with a custom binary change, 5.0.37 so I have SHOW PROFILE, and 5.0.33 so I have microslow patch. With new patches becoming available from the community, I hope I can see builds that combine all known patches that Dorsal Source may have. I think this is going to be a great project. MySQL Conference 2007 Day 4 started early again at 8:20 am with PHP on Hormones by the father of PHP Ramus Lerdorf. A very funny man, one of the best insightful talks of the conference (rather scary actually). Here are some opening comments. In his own words as Keynote speaker. “I’m here because I’m old”. Php 1 from 1994 started after seeing Mozilla in 1993. Because it was just me using it, I could change the language any time. It’s changed to be more OO because people expect that. Universities teach this. Hey, I was fixing bugs in my sleep. Iwould wake up, and in my mail box there would be bug fixes to bugs I didn’t even know I had. People need to attract other people, it makes you feel good, it comes out when you interact with people. It’s not what people think about you, but rather what they think about themselves. PHP was my baby, giving up control, just because I started it, doesn’t mean I have a bigger say in it. Once you build a framework your done, the users build the site, they drive the content. The same people that work on open source projects, are the same people that use websites. It your sites falls apart your done. Excellent tool to see where time is spent in the code. You have to run a profiler. Example of using Drupal. It turns out 50% of time was spent in the them, it had 47 SQL queries, 46 Selects. Went from 4 per second to 80 per second, without any code changes. Some performance options, and some caching. Guaranteed you can double the speed of your website by using a profiler. People are venerable because people run older versions of browsers, and their data is not secure, and you can’t secure their data. IBM webpage, on article about security. Tool to find holes, banks, insurance companies, CIA, even Yahoo where I work. You know if they have been to bankofamerica.com, you can tell if they are a customer, you can tell if they are logged, you can then see their cookie credentials. You don’t know if any sites have these problems. You should never ever click on a link. It sort of defeats the purpose of the web. Never use the same browser instance to do personal stuff and browsing. There isn’t much we (PHP) can do to secure sites developed. Built a filter extension in 5.2, back in 5.1. Two lines to grap the Atom feed from flickr of photos just uploaded. That’s all I have to add to my code. The really make you want to use the servers. It’s so easy. API drives passion, drive people to use your site. You can add a lot of cool things to your sites. We want MySQL to fix our problems first. we describe problems that matter to us. Make it easy to do the tasks that must be done. Reduce, Reduce. Why does it mater, support hundreds of servers, spend time solving more interesting problems. You generally have lots of problems to solve. number of select/updates/other/commits/rollback/binlog bytes written. There are all great features but we are much more limited in what we can use. Management want to know we don’t loose transactions, not loose some transactions. MVCC must have update concurrent with query. ext2 and 4.0 are great, there are the same generation. Trying not to use RAID, not battery backed raid etc, we try work around with software solutions. We do use RAID 0, but we also try software solution. When we have the right HA solution, we won’t need RAID. * This is how we guarantee to management for Zero Transaction Loss. Latency single stream 1ms, multi-stream 10ms. This is acceptable for us. mysql does not provide a way to maintain a copy of a master’s binlog on a replica. By copy we me a file of same name and equivalent byte for byte. Hierarachial replication works much better where a slave can disconnect from one replication proxy and reconnect to another with adjusting binlog offsets. Q: What keeps up from moving to 5.0? Here are some notes from the MySQL Server Roadmap session at the MySQL Conference 2007. I have just completed my presentation at the MySQL Conference 2007 on MySQL for Oracle DBAs and Developers. You can download a PDF copy of my presentation here. Moving into the user sessions on the first day at MySQL Conference 2007, I attended Building a Vertical Search Engine in a Day. Some of my notes for reference. Nutch & Hadoop are the technologies that run on a 4 server cluster. Sample starting with www.mysql.com in 23 loops, 150k pages fetched, 2M URL’s found . Our third keynote at MySQL Conference 2007 was titled Building the Ultimate Database Container with RHEL, MySQL, and Virtualization by Michael Evans. A Non profit idea from Nicholas Negroponte. Aim is to build & distribute inexpensive laptop systems to primary & secondary school students worldwide. Sell to young children in developing countries. The overall dynamics have attracted a lot of interesting people in the world. The ability and goal is to make the device together, bringing all H/W and S/W people together. This is the first time for a new opportunity in the last 10 years. The sugar user interface is a completely new experience. One key point — No backward compatibility needs. More information at www.laptop.org. Wikipedia Reference. Some videos at You Tube Inside One Laptop per Child: Episode one and Slightly better demo of the OLPC User Interface. Without missing a beat at MySQL Conference 2007, we moved from Marten’s keynote to The Art of Innovation by Guy Kawasaki. Extremely fun and entertaining. His 10 points. To a VC, do not say “you want to make money”, that is understood. You will attract the wrong team. Not a Mission statement (50-60 words long), but 2 or 3 words. Create a mantra — Why do you exist? If you get stuck try the Dilbert mission statement generator. People that are not your target market are using it. Take the money, ask the people why you are buying, ask what you can do better. Ok to ship stuff with crappy stuff in it, but important to continually revised and improve. top right — X You need to be High and to the right. Fandango — It’s either Fandango, or Clubbin. You need to be like the President of the United States – You need to high and to the right. Got a great laugh from the crowd. Innovative, you need to pitch for what you want. The optimum number of slides in 10 slides. Given the slides in 20 minutes. A bonus to our friends in the community. Read more about Guy at his website Guy Kawasaki. As I mentioned in MySQL Conference – Rewarding the Community, Paul McCullagh, the creator of the Community Transactional Storage Engine PBXT won the Community Code Contributor of the Year award. A photo for Paul. Great work. It’s an early start this morning at 8:20am at MySQL Conference 2007 with CEO Mårten Mickos keynote talk Welcome and State of MySQL AB. Here are some of the key points that impressed on me. “The Participatory & Disruptive spirit of the Dolphin.”. Open Source disrupts inefficient models and produces new wealth. You have the forge, the planet, community contributer program and many more. We want to be known as The Online Database. They all have an Open Source strategy, the develop open source products, they use and partner with MySQL. He also mentioned MySQL Enterprise Connection Alliance – MECA. 100 major locations in nearly 30 different countries. There is a great focus on culture – global culture. MySQL – The best online database in the world. At MySQL Conference 2007, CEO Mårten Mickos in his opening keynote Welcome and State of MySQL AB rewarded the community. Those that contributed to “The best database in the world”. Did anybody else spot it? His spirit is evident with his opening slide “The Participatory & Disruptive spirit of the Dolphin.”. Stay tuned for more, it’s going to be a big day today. My first tutorial today at MySQL Conference 2007 is Scaling and High Availablilty Architectures by Jeremy Cole and Eric Bergen of Proven Scaling. While not discussed, the premise is to Cache Everything. MemCache is a key component to any scalable system. Using the analogy from a newborn child Jeremy stepped us through the categories Newborn, Toddler, Teenager, Late teens to 20s, Adult. In Late teens to 20s, is where most systems die a slow death, he termed “the awkward stage”. This is where scalability is critical, and a meltdown for example can ruin you. Downtime is also just not acceptable for your user community. When your Adult you need to perfect the ability to deploy incremental changes to your application seamlessly. As the system grows, optimizations changes that may have worked are now affecting your system. It’s important to revisit during each stage. Most applications mainly implement a horizontal partitioning model. Different components of your systemcan be scaled by a “partition key”. The different models include fixed “Hash key” partitioning, Dynamic “directory” partitioning, Partition by “group” and partition by “user”. The Dynamic “directory” is a lot harder to implement, but is ultimately more scalable. One of Partitioning Difficulties, is inter-partition interactions. Ultimately the solution is duplicating meta-data or duplicating data. Overall reporting is also more difficult. What if we want average for users per location, if we partition by users. Most systems user driven and partition by user. A newer strategy is to partition by group. For implementing a Fixed Hash Key partitioning. You define 1024 physical buckets (can then the easily dividable) 0-1023 (user_id % 1024). Coded then by range to physical machines, 0-255, 256-511, 512-767, 768-1023. The plus side is very easy to implement, you can always derive where something is. The biggest problems is scalability, e.g. going from 4 machines to 5. You also don’t have any fine grained control over buckets. For Dynamic Directory partitioning you maintain a database of mappings to partitions. A user can be easily moved at a later date in a much finer grain. MySQL Cluster is designed for this type of application. It is not necessary however, a well configured Innodb Hardware solution with memcache can easily provide the same functionality. The only writes are new users, or update partition keys, with a lot of reads. This open source product implements a “standard” partition-by-key MySQL system written in Java. Many organizations have a somewhat similar built system, but this is an example of something that’s been open sourced. The Hive API language should be the only code that should be re-written to be application development language (e.g. PHP,Ruby) when needed. Avoid downtime due to failures. No dependency of DNS changes. No Dependency on code changes. Fail-back must be just as painless. The overall objective is speed. Understanding MySQL Replication is important to understanding HA options. MySQL Replication is Master-Slave One Way asynchronous replication. Slave requests binary logs from last position. Master sends binary logs up to current time. Master keeps sending binary logs in real-time. Dual Master provides an easy configuration to fail over, it doesn’t provide benefits in throughput. Can help solve online schema changes without downtime. Assuming existing queries will perform both pre and post schema. (set-sql-bin-log=0 for the session is the tip). There are a number of caveats. Ultimately for High Availability you have a trade off, data loss (minuet) to scalability. The MySQL Conference has started. It will be a long week, still yet to prepare my own presentation for tomorrow. Old friendships already renewed, plenty of faces to names already, and we have yet to hit the first session. I’ll be speaking at the upcoming 2007 MySQL Conference & Expo (Why they dropped the word User, who knows), this time with Guy Harrison (Author of many books including MySQL Stored Procedures). We will be talking on MySQL for Oracle DBAs and Developers. Anyway, good friend Paul McCullagh, creator of PBXT will be also speaking on PrimeBase XT: Design and Implementation of a Transactional Storage Engine. 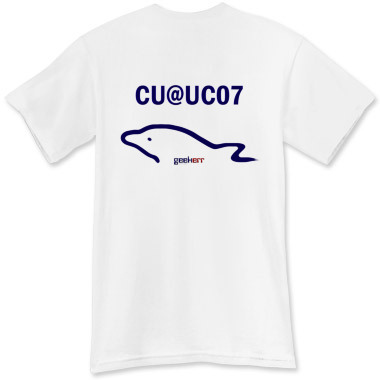 He coined to me in an email “CU at the UC”. I’ve done a further level of refactoring, and added marketing. You can buy the shirt online here. (More colors including black and products coming, if you want it now, please ask).